The Vienna Philharmonic orchestra is one of the most respected performance groups in the world. A national treasure in Austria, the Austrian Mint celebrates its place in national history on the 2015 1/25 oz Gold Austrian Philharmonic Coins. Today, you can purchase this coin from Silver.com in brilliant uncirculated condition. Each of these coins have a 4 Euro face value and contain .9999 pure gold. Contains 1/25 oz of .9999 pure gold. Austria’s Vienna Philharmonic orchestra was founded in 1842. The group performs all of its home concerts at the Musikverein Golden Hall in Vienna, the nation’s capital. 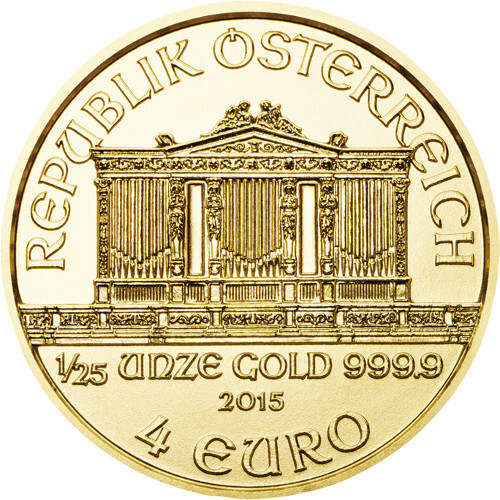 The 2015 1/25 oz Gold Austrian Philharmonic Coin is just the second year that the small-weight coin has been produced after being introduced during the 2014 minting series. 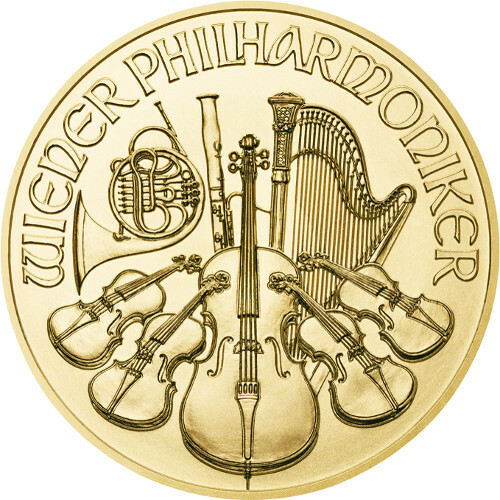 The Gold Austrian Philharmonic series was first introduced in 1989 with 1 oz and 1/4 oz weights. The 1/2 oz and 1/10 oz coins were only introduced in 1994 and 1991, respectively. The Austrian Mint is one of the oldest facilities in the world. Duke Leopold VI founded the mint in 1194 using a 15 tonne ransom of silver paid to him by England’s Richard the Lionheart. The latter paid the ransom to the Duke in order to secure safe passage through Austria for his army on its return from the Crusades in the Middle East. If you have any questions about purchasing a 2015 1/25 oz Gold Austrian Philharmonic coin, in brilliant uncirculated condition, don’t hesitate to contact a Silver.com associate. You can reach us on the phone at 888-989-7223 or on the web using the live chat feature located on our contact page.